Do you have been through situations like cracked screen, water-damaged, black screen when you use Android smartphones such as Samsug Galaxy Phone. When facing these situations, probably we consider that the worst thing is not the phone is broken, but is the fact that we can not to access the precious data including contacts, messages and more that have been stored in our phone memory, which are of great importance to us. In order to get back the data from the broken Android phone, we may attempt to find any way to help us with this problem but doesn't make it in the end. Perhaps it will upset us a lot that we can not recover the data and it will let us be disappointed for the unfortunate situation which happens to us. But now don't worry, I think with the help of the software, Samsung Galaxy Recovery, it is a piece of cake to help us recover these data from broken Android phones. When it comes to the Samsung Galaxy Recovery, it is a powerful toolkit for Android users to recover deleted data including text messages, photos, contacts, call history, videos, WhatsApp messages, audio files, and more from Android phones and tablets. What's more, apart from what have metioned above, it can aslo enable to recover data from broken Android phone, which is really beneficial to us. Then I will show you the steps how it works, just take a broken Samsung Galaxy S6 as an example. First of all, download and install the recovery program on your computer. After launching the recovery program on your computer, choose "Broken Android Data Extraction" in the primary window, and connect your phone to PC via its USB cable. When your phone is detected by the program, please click the "Start" button on the left to enter the fixing feature of your phone. In the general case, you will be asked to selected the file types that you need to extract, just do it and press "Next" after that. Skip to next screen, please choose the fault type of your phone. Choose the one according to your phone's practical situation, then it will lead you to the next step. For some phone models, this interface may not be present. If you don't see it, ignore it. 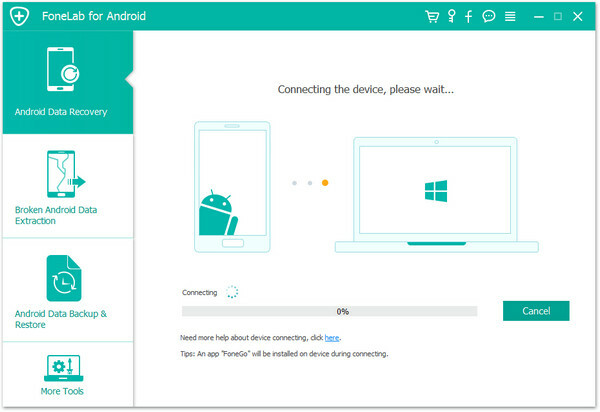 Then on the new window, choose the correct "Device Name" and "Device Model" for your phone. 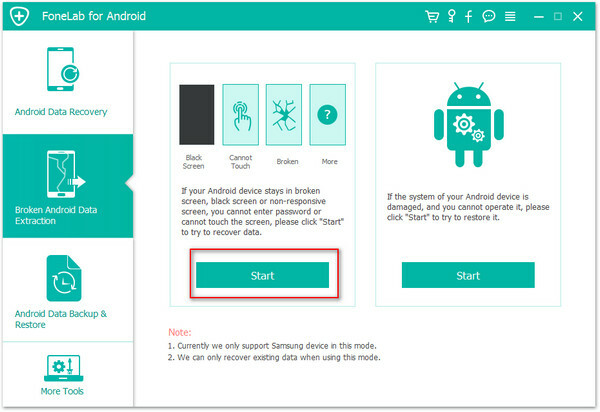 Currently this function only works for some of Samsung devices in Galaxy S, Galaxy Note and Galaxy Tab series. Begin your start, please enter "confirm" to make sure that you have chosen the right name and model of the device that you need to recover data from. Here, the program need your S6 to enter the download mode, you can follow the below three instructions to get your broken S6 enter the Download Mode. a. Power off the Galaxy S6. b. Press and hold Volume "-", "Home" and "Power" button on the phone concurrently. c. Press "Volume +" button to enter download mode. Then make a connect between your broken Galaxy S6 and the computer. Samsung Galaxy Recovery will analyze the phone automatically. After step 4, Samsung Galaxy Recovery will display all the file types by categories. Then you can choose the files you need and simple hit "Recover" to save all the precious data you need with a click. It is really a good helper, you can also restore your data from a damaged/dead/cracked screen phone and the SD card inside, just have a try.